It isn’t outlandish for me to claim that I’ve owned more fleeces in my life than anyone else my age. From the early ’90s until now I buy at least one fleece jacket a year. I’m not sure if the rest of America was gripped by the fleece-craze, but my family sure was and for good reason. There aren’t many articles of clothing as practical, light, and inexpensive as the humble fleece. They really do keep you warm, but with so many manufacturers, styles and prices, buying the perfect fleece can be a little overwhelming. Below are a few important things to consider before pulling the trigger and buying that chic fleece you’ve been coveting since August. We can’t give you each and every detail for all the fleeces listed below, but you’ll get a good overall idea of how each stacks up against the others. 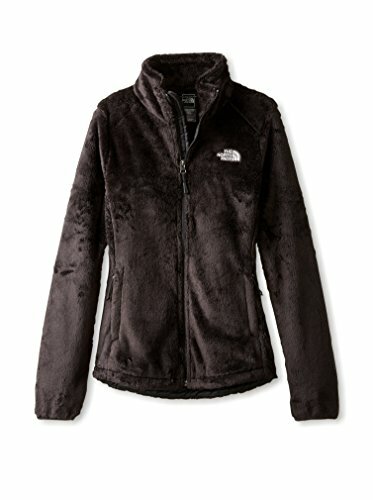 The first five listings are for women’s fleeces, the last five for men. This makes a strong argument for my favorite fleece jacket. In fact, it’s the jacket I’m wearing while writing this article. 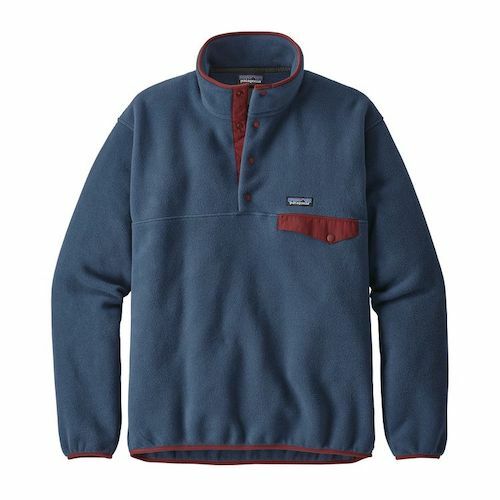 Patagonia pioneered the fleece and with its retro style, it’s a classic. The Synchilla is a great wardrobe staple and is a versatile piece of clothing. It all depends on what you’re seeking, but the fleece is not a technical piece of clothing. Synchillas are simple fleeces with nothing more than the best fleece manufactured by Patagonia. It is double-sided, plush, and super soft that creates plenty of warmth. They’re roomy and super casual but perfect for an easy hike or that post snowboard outfit. Warmth is a big stand out with this jacket and I can comfortably walk around town in freezing temperatures. My chief complaint with the fleeces is they’re very bulky and have a loose cut. It’s great if you want a relaxed look at home, but they eat up a ton of luggage space while looking a little too casual outside of North America (not Zermatt approved attire). 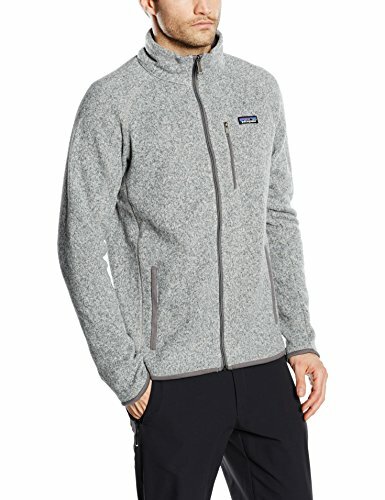 However, the fleece manages to hit the perfect price point at just over $100, reasonable for Patagonia, while delivering a high quality product. It shouldn’t be much of a surprise to see Arc’teryx at the top of this list. They’ve been producing high leading class outdoor wear for years now, but that does come at a price. The Covert Cardigan is a full zip jacket with a slim cut and well-designed panels for active movement. This creates a versatile jacket that can be worn as a mid layer or casual jacket. 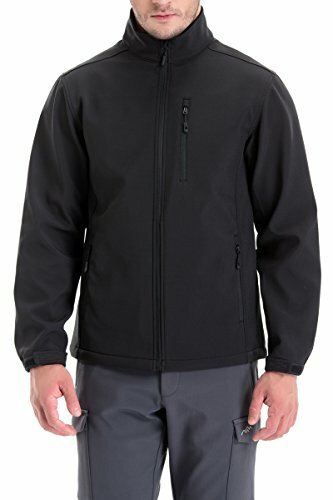 It’s not a technical fleece like some of the products below and is similar to the Patagonia Better Sweater. The only real difference we can find between the two is a slight step up in quality with Arc’teryx and price. If you have a favorite brand between the two I’d stick with that. 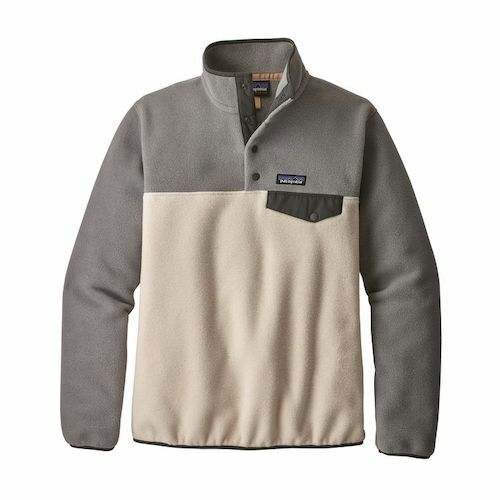 My Patagonia better sweater is the perfect fleece sweater, especially for a mid layer. It’s heavy duty, flexible, and still slimming while still being one of the warmest fleece jackets on this list. It is a Patagonia after all, one of the best outdoor gear brands on the market meaning it’s high quality (but also a higher price tag). Yes, they are expensive, but they last for years so I usually buy one every once in a while and ball out when Patagonia or REI have their annual season sale. The better sweater comes in either a half zip up style or full zip up. What I really like about Patagonia products like this is that it looks stylish anywhere outdoors! 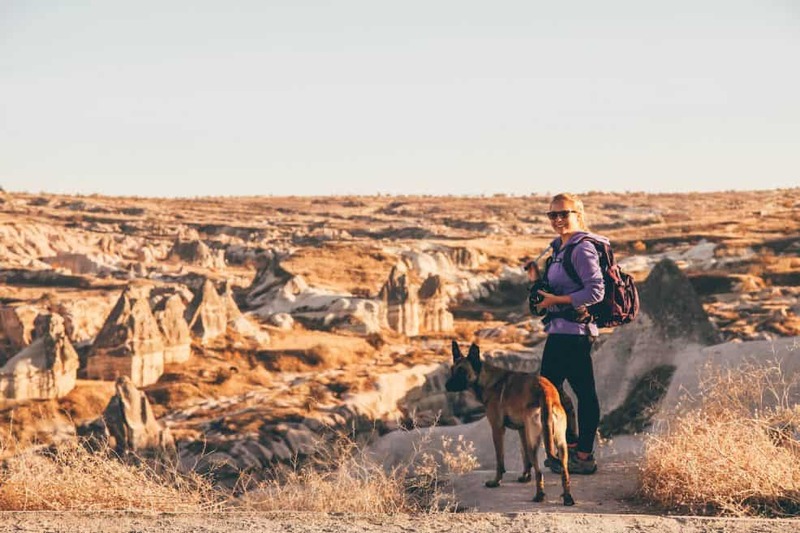 Lots of outdoor and travel enthusiasts associate Columbia’s name for quality, and sometimes a steep price too. Columbia’s Women’s Benton Springs Full-Zip Fleece Jackets have a relatively inexpensive starting price, but depending on the style, features and size you choose, they can be much more pricey than many of their competitors. As the name says, the fleeces are full-zip, which I’ve always found to be much easier to put on and take off than partial-zip ones that need to be pulled over the head. They’re made from 100% polyester and have two zippered security pockets large enough to accommodate most phones, your keys and that granola bar you’ve been saving for your mid-morning snack. They’re also sporting a new slim-cut design for those with active lifestyles and the contoured bodies to match. I always knew that one day, if I was patient, those Spanish classes I took in the 10th grade would pay off. Well, today is that day. The marketing department at North Face has hit the mark, because in Spanish, Osito means teddy bear. If you’re like me, the thought of teddy bears conjure warm and snuggly images that’ll make you want to slip on thatNorth Face Osito 2 fleece jacket, curl up in front of the fire with a cup of tea and dive into that novel you’ve been wanting to read. The Osito jackets feature high-pile fleece, which is thicker and more velvety than standard fleece. They come in more colors than you can shake a stick at, and feature high collars, elasticized wrists, two zipping pockets, and are backed by North Face’s hearty warranty. Their website features a helpful sizing chart that’ll help you get the correct size the first time. For those of you who aren’t familiar with Amazon Essentials, get ready, because you’re about to save a lot of money. 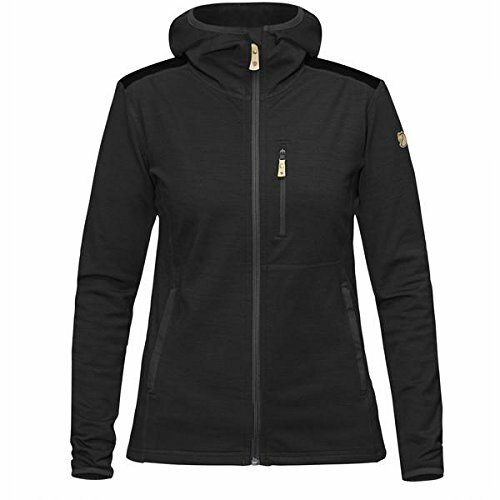 Designed and manufactured to compete with popular brand names at a fraction of the cost, Amazon Essential’s products are usually best-sellers in their categories, and their Women’s Full-Zip Polar Fleece Jackets are no exception. Made from 100% polyester, they’re machine-washable and come with a full-zip front and two zippered, side seam pockets. These fleeces fall into the mid-weight category, which means they’re designed to keep you warm in moderately cold weather. They’re available in lots of cool colors, have a tall collar and elasticized cuffs and come in at the low end of the price spectrum. With all these characteristics, Amazon’s women’s fleeces are a great value for someone looking for a cheap fleece jacket. In true Fjallraven fashion, this jacket is top of the line and looks dreamy on. However, it’s one of the most expensive jackets on this list and you are definitely paying a price for that style and comfort. The Keb is a midweight fleece jacket with one chest pockets. The Keb is made out of a polyester and wool blend providing optimal warmth, but still has a decent amount of moisture wicking ability. The hood on this fleece jacket will protect you in the case of rain or snowfall, but still maintains it’s stretchy, feminine, and sleek look. If the term ‘double-layered’ sounds like something you’ll need to keep you warm on your upcoming trip to Iceland, then the Baleaf Women’s Double-Layered Full-Zip Hoodie Fleece Jacket may be what you’re looking for. Made from two layers of 100% polyester, these fleeces will bottle in your body’s warmth, while still allowing flexibility and ease of movement. With full-length zippers, detachable hoods and adjustable drawstrings, they’re versatile enough to be a good choice no matter what Mother Nature throws at you. 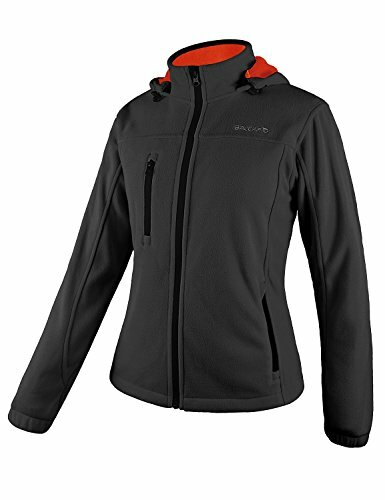 It’s also one of the only women’s fleece jackets with a hood on this list! 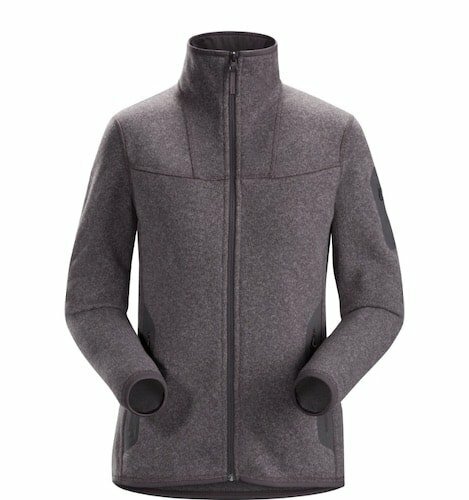 Baleaf’s women’s fleeces also have high collars and two zippered side pockets which are able to accommodate phones up to 5.5 inches diagonally. Though they don’t come in as many colors as some of their competitors, they’re inexpensive and have a nifty, zippered breast pocket and drawstring at the hem to keep the chill out too. Not that this jacket is trash – far from it actually. I only say that because if something happens to this jacket at it gets ruined you won’t be afraid to part with it as the cost is so incredibly low. 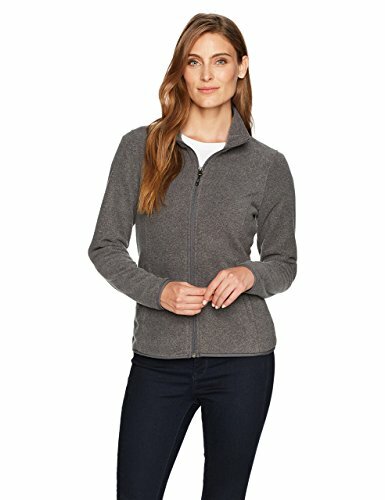 If you’re a value shopper who delights in getting lots of bells and whistles without paying an arm and a leg, then Oalka’s women’s fleece jacketsdeserve a good look. With a less expensive starting price than any other fleece on the list, Oalka’s women’s fleeces don’t skimp on quality or features. Made from plush, 100% polyester, they sport full-length zippers and are slim-cut to show off that hourglass figure you’ve been working on since May. There’s an adjustable elastic drawstring at the hem to keep out those pesky drafts of chilly air too. They’re available in sizes from extra small to XL. I absolutely LOVE this fuzzy fleece jacket. The design of it and the soft plush feeling is unlike any I have ever seen or felt in a women’s fleece jacket. Perhaps that’s because it is made out of midweight Italian fleece. This jacket has a few other notable features including vintage microsuede accents that match the rest of the jacket. A two zippered chest and hand pockets and even a stowaway hood that will create a larger collar. I love just how warm and stylish this fleece is. You can easily throw it on over anything and still look great! Synchillas are simple fleeces with nothing more than the best fleece manufactured by Patagonia. It is double-sided, plush, and super soft that creates plenty of warmth. They’re roomy super casual and perfect for an easy hike or that post snowboard outfit. Warmth is a big stand out with this fleece and I can comfortably walk around town in freezing temperatures. My chief complaint with the fleeces are they’re very bulky and have a loose cut. 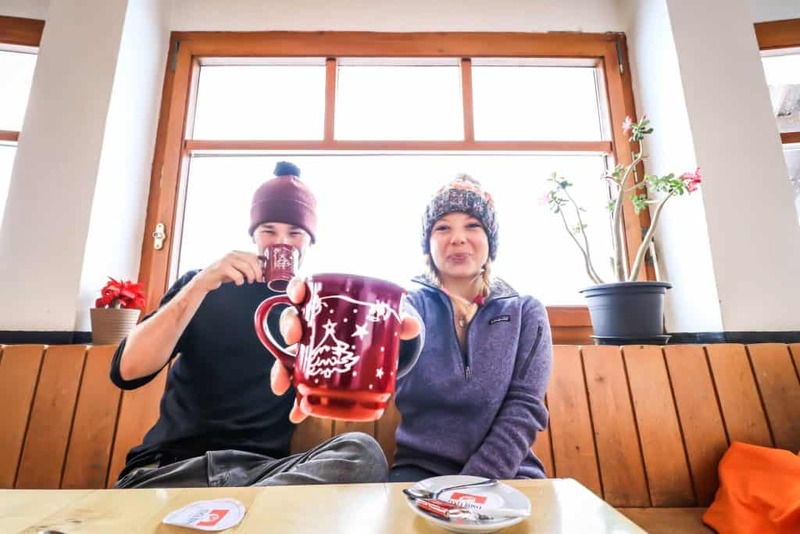 It’s great if you want a relaxed look at home, but they eat up a ton of luggage space while looking a little too casual outside of North America (not Zermatt approved attire). 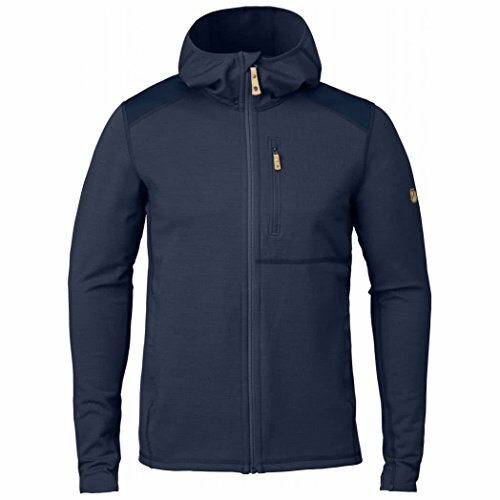 The Covert Cardigan is a full zip jacket with a slim cut and well designed panels for active movement. This creates a versatile jacket that can be worn as a mid layer or casual jacket. I already mentioned thePatagonia Better Sweater as a favorite for women, but Cameron also absolutely loves his. He’s wearing it in the photo above and sports it almost every fall day. The better sweater comes in a full zip up and quarter zip up. It looks sporty on men, but still can double as a nice fleece for a night out. Patagonia also recently updated their fleeces with low-impact dye processing so that these fleeces don’t lose their color over time. This fleece isn’t super light, and has a medium weight. However it does pack up relatively tight in a suitcase! 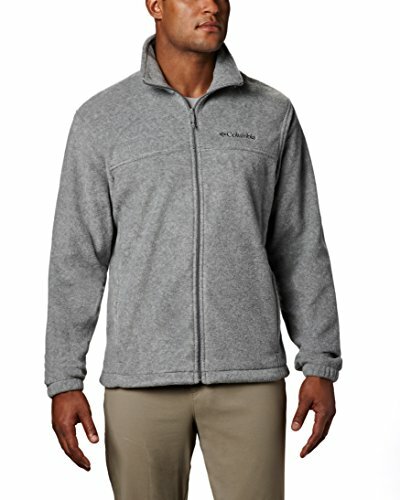 With a surprisingly inexpensive starting point and available in nearly 20 vibrant colors, a few of which are nifty two-color combinations, Columbia’s men’s Steens Mountain fleece jackets are made from soft, 100% polyester, and have two side-zippered security pockets that’ll hold your keys and phone safely. Though light and comfortable, the fleeces will keep you warm enough on cool autumn days, and if you’ve got an athletic build that you’d like to show off, you’ll like their modern fit too, although the fit isn’t quite as contemporary and athletic as some of the others. They’re available from small to 2 XL. Loyal customers of Amazon Essentialsproducts seem to like the quality and value they get when compared to pricier brand-name products. 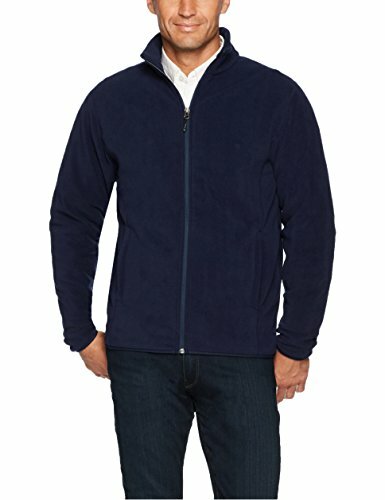 With an enticingly low price, Amazon Essentials Men’s Full-Zip Polar Fleece Jackets aren’t offered in quite as many colors as some of the other brands, but with their features and quality construction you probably won’t care that they don’t come in amber sunset or morning mist. Made of 100% polyester, this mid-weight, machine washable fleece isn’t going to be enough for your upcoming airdrop into Antarctica, but it’ll keep you warm in early spring or late fall without weighing you down. It comes with elasticized cuffs to keep those pesky breezes out, and zippered pockets to make sure your keys and phone are where they’re supposed to be after a day on the water or trail. They’re available in sizes from extra small to 2XL. This Kuhl jacket prides itself on having 100% polyester that is guaranteed not to mat. However, it’s incredibly soft, providing exceptional warmth and comfort all day. It’s a full zip fleece so it can be put on over just about anything, and also has two hand warming pockets for those cold winter days. What I like most about Kuhl jackets are the signature thumb loops so there is never a breeze allowed to ride up your shirt. From someone that spends have the year in cold weather, this is a major plus to this jacket. 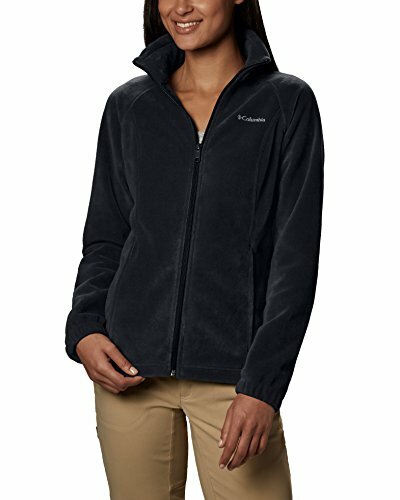 This fleece jacket can be easily adjusted to your waist at the bottom hem. Leave it to trendy Under Armour to make the fleece that looks the most cutting-edge and athletic. 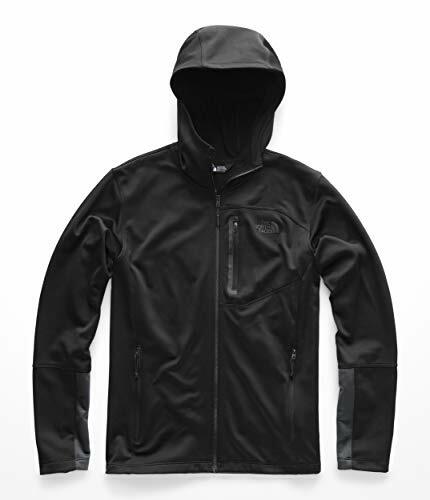 More like a hooded sweatshirt than a traditional fleece, it sports Under Armour’s Storm technology, which repels water without sacrificing breathability. Under Armour’s fleece is light and stretches to allow unparalleled mobility so you can wear it on the field, court or trail without feeling restricted. It also has hand pockets and an internal phone pocket on the right side and is available in sizes from extra small to 5 XL. Though technically a fleece, this hoodie, unlike the others on the list, is made from fibers other than polyester, so it’ll have a different, less plush and more athletic feel. It’s available in nearly 20 colors, and though its starting price is a bit on the high side, it’s a lot more contemporary and trendy than some of the other fleeces that might not be out of place on your grandfather. If you’re into trendy but aren’t going for the strictly athletic look of Under Armour’s fleece hoodie, then North Face’s Men’s Canyonlands Hoodie may be a good choice. Don’t get too excited yet though, because due to its price you may need to get a part-time job to pay for it. It is, however, in my opinion, one of the best and most contemporary looking fleeces on the list. Sporting a cool, zippered breast pocket, two zippered side pockets and a high-collared hood, it just looks good, and it has all the features you’d expect from a North Face product. It comes in a variety of heather colors and like its rivals is made from 100% polyester, though the material is brushed, making it less plush and more stretchable so it’ll move with you when you’re on the go. Definitely aimed at a younger and fitter crowd than some of the others, North Face’s fleeces are specifically made to fit snugly to show off that athletic body. They’re available from small to 2 XL. The Keb is made out of a polyester and wool blend providing optimal warmth, but still has a decent amount of moisture wicking ability. The hood on this fleece jacket will protect you in the case of rain or snowfall, but still maintains it’s stretchy and sleek look. 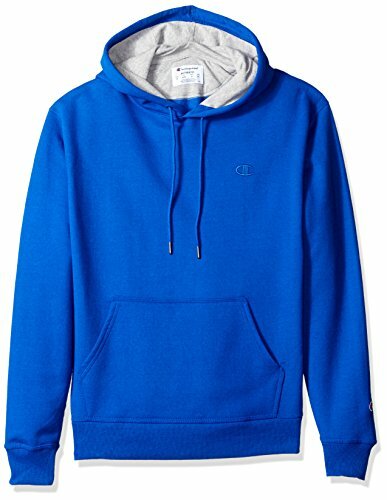 Coming in last, but by no means least is the Champion Men’s Powerblend Fleece Pullover Hoodie. 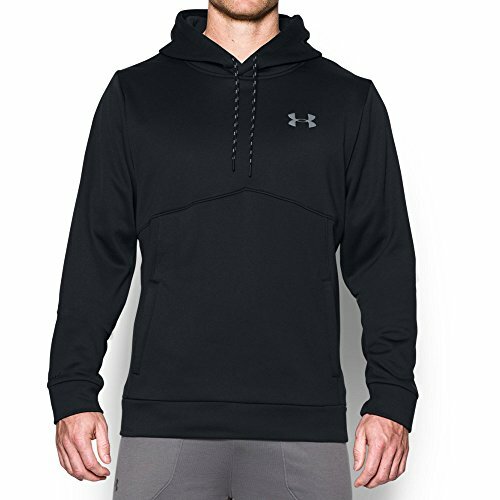 Like the Under Armour fleece it’s more athletic and less traditional in design and appearance, but unlike the Under Armour hoodie, you won’t have to eat beans and rice for a month to be able to afford it. It comes in dozens of attractive colors and features a drawstring cinch at the neck to tie the hood in place if you get caught in the wind and rain. Unlike the other fleeces on the list, it’s made from 50% cotton and 50% polyester, which makes it a bit heavier and therefore warmer than some of the thinner, 100% polyester fleeces. On the downside, the material probably makes the Champion hoodie a bit more absorbent too. It’s available in pullover or zip and has a kangaroo-style pocket in the front to keep those hands warm on cool days. This jacket is designed for men who are active in the outdoors year-round and need something to protect them against the wind. During its reg Spring, Fall, and Summer nights you can easily wear just this fleece jacket and be fine. In the winter it is recommended to put warmer layers on underneath and put the windproof jacket on above. I absolutely love that you can machine wash this jacket without losing its shape and affecting the quality. It’s also marketed as water resistant and durable water repellant on its outer layer. That doesn’t mean it would survive a flash flood, but if you find yourself caught in the rain for a few minutes this jacket will definitely hold up to mother nature. It had both inside and outside pockets and should easily be able to carry anything you could possibly need. Fleeces come in more varieties than you’d think possible. Long-sleeve, vest, full-zip, partial-zip, ¼-zip, hooded, unhooded, men’s, women’s, athletic cut, generous cut, and the list goes on. To make things easier, try looking for words in the product description that will tell you what the fleece was designed for. If for example, you’re after a lightweight, early-fall fleece to wear while skipping through the apple orchard on a 60-degree afternoon, then the Alaskan, Sub-Zero Anti-Hypothermia Survival Fleece may be more than you’re bargaining for. Thinking about what you’re looking for beforehand can streamline your search. It’s important to pay close attention to the fit of your fleece jacket. Would you prefer to have something more form-fitting and sleek so that you can wear it out and still feel stylish? Or would you prefer to feel more relaxed and casual in your fleece jacket? This one is a little more difficult to determine, as most fleeces are made from similar or identical materials. Sometimes popular brand names are associated with higher-quality products, but it’s not always the case. In addition, all of the fleeces on this list are imported. In the age of the internet, buyers have more information at their fingertips than ever before. Chances are hundreds or even thousands of people have bought the products you’re considering. Take advantage of their experiences and reviews. They may save you a lot of heartaches and hassle down the road. Not surprisingly, you can buy cheap fleeces, ultra-expensive ones, and ones at all price- points in between. Sometimes there’s a direct correlation between price and quality, but sometimes there isn’t. Again, click on those customer reviews. Nowadays, most products you buy on mega-retail websites come with pretty robust warranties and return policies. Competition is tough, and no-hassle return policies are things manufacturers and retailers need to offer to stay in the game. Read the fine print carefully so you’ll know what to expect if the product doesn’t meet your expectations. Fleeces are available with a number of features that you may or may not want, like tall, full-zip collars, internal and external pockets, with and without zippers, elastic at the sleeves and waist to form barriers against cold gusts, and drawstrings at the neck to do the same. Depending on where you’re going and what you’re doing, these features can make a big difference in how you and your fleece get along. 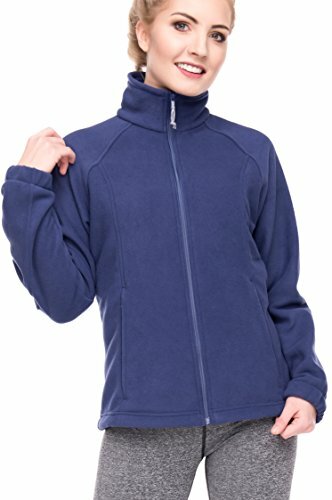 The two main types of fleece jackets are full zip or half zip. Full zips are easier to manage and gives you more versatility when taking on and off. For women, full zip fleece jackets also don’t mess up your hair. Half-zip jackets tend to have fewer features and are primarily used for keeping warm. 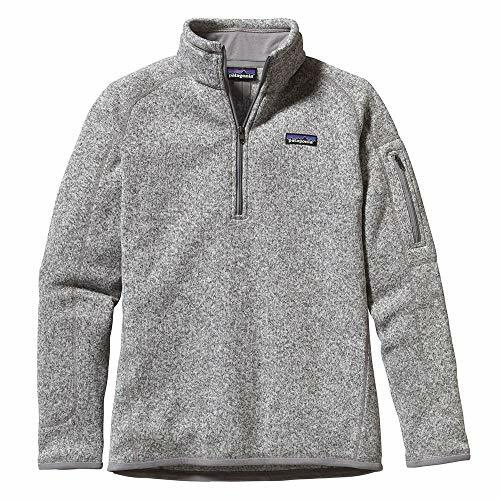 I generally prefer full zips as a woman, but that being said my favorite fleece ever is the Patagonia better sweater (see below).